W&JB Car No. 1 built in 1896 by Barney & Smith Car Co. Number 1 was 38 feet long. Photo from the Edward H. Miller Collection. Harvey Wells of Wellston incorporated the Wellston and Jackson Belt Railway on January 22, 1895. While the Belt Line was conceived as an independent line, it came under control of the CHV&T in June 1895. Construction began in the spring of 1895. It took until January 3, 1896, to complete the 17.25 miles between Dundas and Jackson. The primary purpose of the Belt Line was to operate electric traction service, nationally popular at the time, through the rich and busy coal field between Wellston and Jackson. 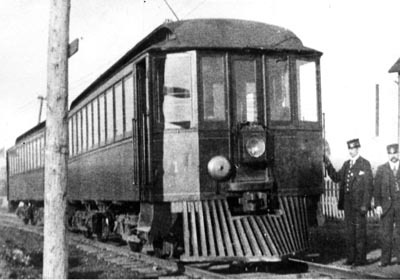 What made the W&JB unusual was that the company was controlled by a steam line and that it used side mounted rather than center mounted trolley poles. 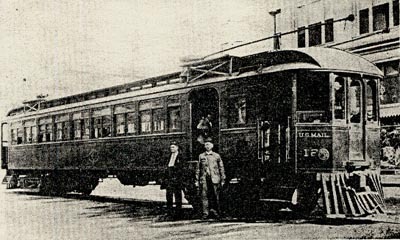 Electric service on the Belt Line lasted only until August 12, 1914, but steam passenger service continued another 17 years. Car No. 12 built in 1903 by Barney & Smith Car Co. of Dayton, Ohio,was 59 1/2 feet long.This photo shows a good view of the unique side mounted trolley poles. Photo from the Edward H. Miller Collection. The extravagancies of the early 1880's and the general economic climate of the late 1890's led the company into receivership on February 25, 1897.